The Spirea is in flower and yesterday, while the sun was shining, its white, scented blossoms attracted a variety of pollinating insects, including all three species of mining bee that are currently in and around the garden. With a body looking like a ginger pipe-cleaner, the female Tawny Mining Bee (Andrena fulva, #4442) looks quite different to the paler male (see Thursday’s blog). 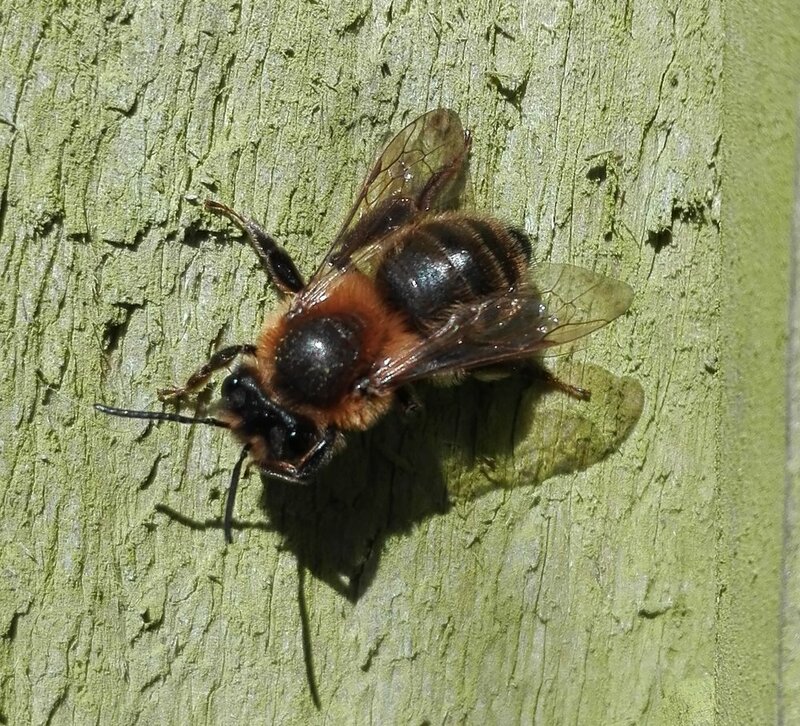 Early Mining Bee (Andrena haemorrhoa, #445) has a fox brown coloured body too, but a darker less fluffy thorax. Finally the grey-coloured Ashy Mining Bee (Andrena cineraria, #61) is also visiting the Spirea flowers. Back to the first photo, this is something a bit different. All black with white spots on its thorax, it’s a Common Mourning Bee (Melecta albifrons). This so-called “cuckoo bee” is a kleptoparasite of the Hairy-footed Flower Bee ((Anthophora plumipes)). It lays its eggs in the nest of its host, the larvae hatching before the host’s and consuming the competition as well as the stored pollen, ready to emerge as adults the following spring.